Hearts & Horses has been helping families in northern Colorado for 20 years, and our firm is proud to assist them as they continue their important work. Paul Bendele, CEO and owner of Bendele Insurance Agency, Inc. headquartered in Loveland, is releasing details on a charity drive begun last December to help raise funds for Hearts & Horses, a local nonprofit that provides equine therapy to children and adults with developmental disabilities. Bendele himself volunteered his time during the event, helping to raise $250 from client referrals for the charity. 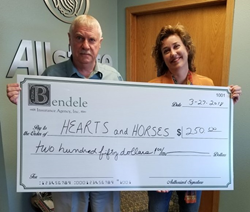 “Hearts & Horses has been helping families in northern Colorado for 20 years, and our firm is proud to assist them as they continue their important work,” said Bendele. More than 180 participants per week take part in programs offered by Hearts & Horses, and veterans always ride at no charge. Readers who would like to suggest new charitable organizations for the Bendele team to support are invited to visit the following page and make a recommendation: http://bendeleinsurance.com/rewards/.